Jacob Frank was born on 4 February 1880 as the son of Samson Frank and Rebekka Stern. He was a brother of greengrocer Frank. He was a full-blood Jew and like many other Jews a merchant. He lived at 14 Molenpad. His house was in an alley off that street. In it were five small houses with minute gardens. In his youth, from 1893 till 1899 he had been errand boy with the paper business of David Wolff in 2nd Hoofdstraat. Later he went to work in the slaughterhouse of Van der Sluis on Ezingerweg. There he worked for many years, but when he got older, he began to work for himself as a merchant in chickens and newborn calves. On his carrier bicycle he went to buy chickens from farmers, which he transported in a basket covered by a gunny sack. He slaughtered them at home and sold them. The calves he transported in a carrier tricycle. Besides newborn calves he also bought stillborn calves, which the Jews called ‘piegies’. Contrary to many of his fellow believers he married a non-Jewish girl (Aaltje Hovenberg) and he was not a member of the Dutch Israelite Community in Meppel. That saved the lives of both himself and his descendants in WW II. 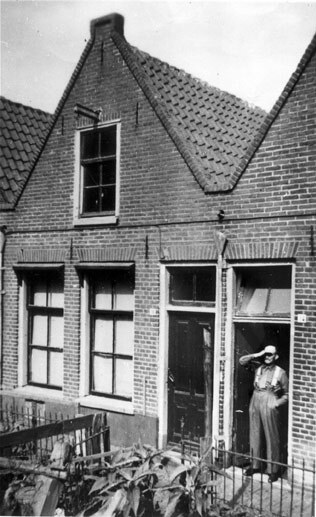 Jacob and Aaltje had four children: Samson, Jacob, Egbert, Benjamin and Alida Rebekka, who all lived in Meppel. He never had much money, but he had a great sense of humour. 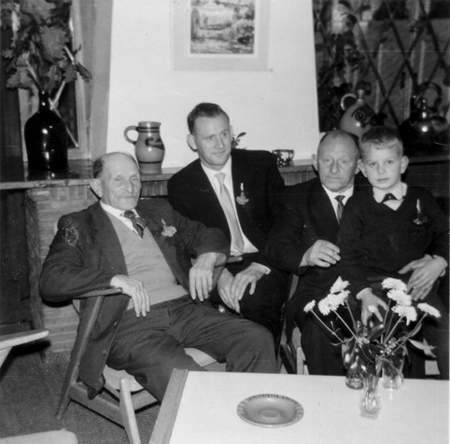 One day, near his home he met the dignitaries Ter Braake and Bralten (both pretty affluent), and said during their conversation: ‘We are really wealthy the three of us here together’. Another time, when a sales representative asked him: ‘How do I get to the station as quickly as possible?’ he answered: ‘ You should walk a bit faster’. 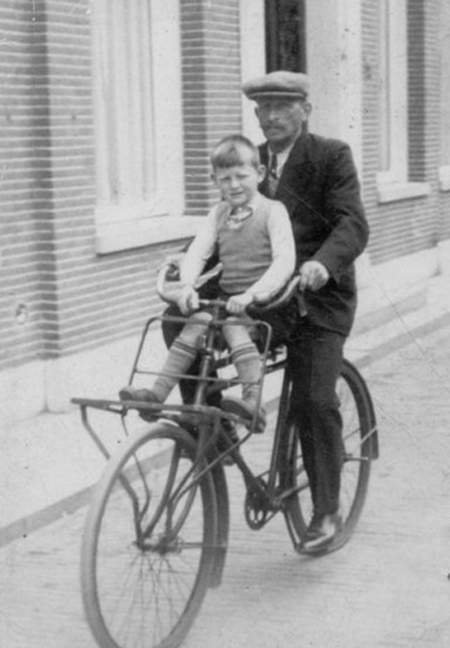 Jacob Frank and his grandson Jacob on the carrier bicycle. Especially Jacob, with four Jewish grandparents, suffered from the anti-Jewish measures. In the eyes of the Germans he was ‘of Jewish blood’ and had to be very careful. A few examples. On his identity card the letter J had to be stamped. An excerpt of his card was sent, together with 73 others, by the mayor of Meppel to the Head of The Inspectorate of the Registers on 23 October 1941. In the course of 1941 he was no longer allowed to watch his football club Alcides play on the Bult, behind his house on Sunday afternoons. He solved that problem by taking a crate to stand on while watching the game from outside the field. When asked whether he could see the game he said: ‘Of course, I am watching from the seat of honour’. He also had to wear the Star of David when this became compulsory mid-1942. He often stood in front of his house with the star on his coat. When someone passed, he tapped at his cap. One time when Mr. Spiker, his neighbour, passed, he warned Jacob to get away. Spiker, who sympathized with the Germans, had heard that the enemy was up to something. After Jacob had had himself registered with the local authorities on 11 September 1942, as having a mixed marriage, he got from mayor Wisman an official ‘declaration of a mixed marriage’. What he did not know then was that Westerbork and what came after was much further off for him. They must have had a constant fear that something would happen to him. Rightly so, for employment in the labour camp at Havelte for those with a mixed marriage was his fate. Grandson Jacob remembers grandpa cycling off, and also that they had expected a worse fate. Jacob had been transferred from Havelte to Meppel with some other Jews with a mixed marriage. They were about to be transported to Westerbork. Right at that moment the February strike(1943) broke out so that there were no trains running. The group was moved from the railway station to the police station. Jacob’s daughter-in-law heard about this and hurried to the police station to speak to police officer Slots: ‘Why is this? Jacob has married a Christian woman. For sure they don’t have to go on transport?’ Slots had no answer to this and asked two German soldiers who happened to be there. Daughter-in-law had to tell her story again, this time in fluent German (she was from Germany). The soldiers were very surprised and complimented her on her excellent German. After some consultation they decided to send Jacob home. Did the woman’s good German help? Jacob was never sent to work camps again. 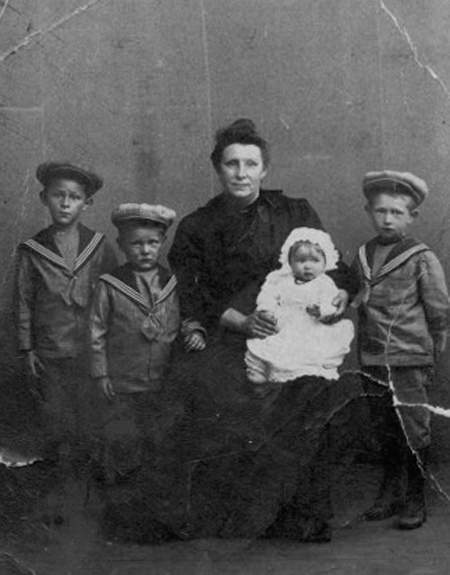 Jacob and the other members of his family survived the war. 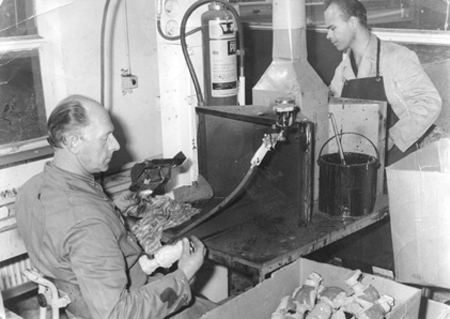 Benjamin (Bennie) Frank  left in the picture  worked in a sheltered workshop. right) Samson, Benjamin, Aleida and Egbert.